My previous post was on the inclusion of certain types of plastic pollution in the movie Finding Dory. Basically, the type of plastic that we see as a problem is really a problem for the 80s and 90s. The problem today is microplastics spreading throughout the ocean and the food chain. This post, I’m going to focus on a more theoretical question about the depiction of plastic in the movie: Does the act of depicting garbage without comment somehow normalize that sight for young children? or to ask it another way, Does Finding Dory succeed in its conservation messaging? I’m going with a gut instinct here that the makers of the film were making an environmental statement with the inclusion of garbage in the movie. If not, we have a bigger problem because that means the thing I fear will come to pass, i.e. that people have become so used to an ocean full of trash that it seems somehow normal and natural to them, has already happened. That would be bad. So I’m going with the more optimistic belief that we as an audience are supposed to be appalled by this garbage and angry that it’s there. But unfortunately, the directors didn’t really make the garbage a plot point nor did they give any information about picking up trash or recycling at the beginning or ending of the film so the audience is left to assume their motivations. So, for those of you that haven’t seen the film, maybe take a look at the previous post to watch the Dory preview, but here’s a few stills from the movie so that we can get an idea of how trash is being depicted. In the past, overt environmentalist messages in animated films have been just that: overt. Fern Gully (1992): The Last Rainforest is one of my personal favorites. I’m old enough to remember Fern Gully when it was new (when I anthropomorphize pollution in my head it sounds just like Tim Curry). Fern Gully was heavy handed and pretty much hit all the high points of environmental concerns- animal testing, native rights, logging, eco feminism. This was a movie for the 80s and 90s crowd raised on the even heavier handed Captain Planet. Our little hearts ate up these messages and we swore to always protect the mythical, magical rain forests of the world. There was no guessing what this movie was about- save rain forests from logging! Wall-E (2008): Another overt message here. Wall-E is startling because it portrays robots as having more humanity than humans where the environment is concerned. Humans destroyed the earth, left it, got super lazy and fat and it takes a robot to fix it. And when the earth is fixed humans get to come back down to earth and reap the benefits of reconnecting with the land. We get skinny! (ugh) We learn skills! We reclaim our humanity from robots who love Hello Dolly!! These movies have issues with their environmental message- Fern Gully’s reliance on supernatural causes of environmental degradation is labeled by Michelle Smith and Elizabeth Parsons as “antithetical to the environmental movement.” Wall-E has some major fat shaming issues that make it basically unwatchable to me (and I won't ever show it to my child for this reason). But it is clear at least that these films are meant to convey an environmental/conservation message. The plot revolves around pollution and the degradation of the Earth and the heroes are those that save the earth. There are more (Bambi, Over the Hedge, Princess Mononoke), but these seem the most prominent in my mind and what is striking is how they differ from Finding Dory. Finding Dory depicts a trashed ocean without it seemingly impacting the characters. Yes, Dory gets caught in a six-pack ring but it doesn’t lead to a story line where she can’t find her parents because she is emaciated from being unable to eat- she gets picked up and taken into a marine facility for "rehabilitation" but the audience doesn't get the sense that she needs to be rehabilitated; she doesn't complain of pain or have any seemingly ill effects from the rings. She seems to be completely healthy while in quarantine. We don't even see the scientists cut off the ring or talk about the horrible nature of this type of pollution. 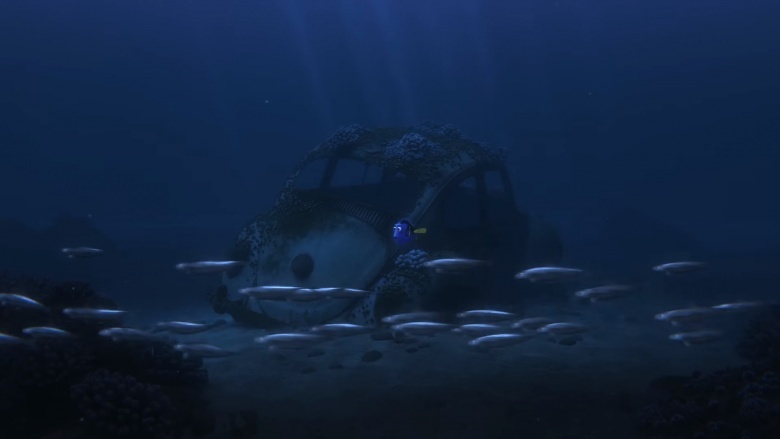 In addition, while searching for her parents, Dory swims through a desert of rusted out automobiles, broken bottles, tin cans, and tires but this is just background. Trash doesn’t stop her from seeing her parents’ shell directions and it doesn’t get her lost in the first place. In fact, during her search she comes across a graveyard of rusted metal containers serving as hiding places for a variety of sea creatures all of whom warn Dory to be quiet or she will wake the squid. Instead of appearing out of place, these cans and containers serve as useful housing for creatures just going about their lives. At no time in the movie is the case made that the pollution is bad or that it hurts any of the animals in the ocean. Adults recognize trash in the ocean (and therefore in the illustrated ocean) as being bad, but can we rely on subtle messages where children are concerned or does this depiction without comment possibly naturalize garbage in these environments? Dolly Jorgensen has written about the way that seemingly unnatural edifices become commonplace in our perception of the marine environment. Her work highlights the way that oil companies seek to naturalize oil rig structures by sponsoring tanks containing these pieces at public aquariums. When an oil rig is decommissioned, companies are responsible for clean up and disposal of those rigs. A common way that oil companies have sought to minimize clean up costs has been to cut the rig off under the water line and leave it as an artificial reef. As Jorgensen points out, governments have to give permission for this disposal and one way that companies are making sure that people have no objections is to give them the sense that rigs actually belong in the marine environment- that they’ve always been there. One way that companies naturalize these rigs is to pay for tanks at public aquariums that include rigs as reefs. Jorgensen uses the example of the rigs to reef tank at the Audubon Aquarium in New Orleans. The Gulf of Mexico tank is sponsored by 5 oil companies (BP, Shell, ExxonMobil, Chevron and KerrMcGee) as well as an individual that has worked in that industry. These companies could have sponsored an exhibit without a rig in the tank (it’s prominent) but they didn’t and their money is going further than to educate children about the underwater environment. It is doing something priceless: naturalizing rigs as reefs in the ocean. After seeing rigs in tanks at aquariums, a place that works to construct the underwater environment for its visitors, who would be surprised when they encounter one in the ocean? The Audubon Aquarium of the Americas is not the only one with a rig tank- some are less prominent than others, but when they become commonplace and unnoticeable, so do the rigs. If this sounds completely off, just bear with me. Do ship wrecks belong in the ocean? Do they seem natural? Are they much of a bother? I ask this because there are a lot of shipwrecks on the ocean floor and it is with these that we see the work of naturalization done so well. Think of the amount of times you have seen a shipwreck depicted in either animated or nature films as part of the underwater landscape. We would be surprised if, in a National Geographic episode our explorers scaled a particularly high mountain and found a plane or tank (it happens but not that much) but we’re not at all surprised by the depiction of ships in the furthest reaches of the ocean. 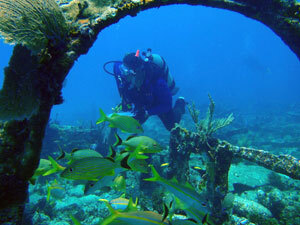 In fact, many sunken ships have grown reefs over their structures and have become protected marine areas. The nine wrecks consist of 6 accidental wrecks, 1 ship purposely sunk to create a reef, and ironically, two ships that were about to be sunk for artificial reefs that broke free from their tugs and went down accidentally. What is interesting to me is how common images of ship wrecks our in my imagination of the underwater world. So much so that sinking ships to create artificial reefs has become fairly common. Instead of questioning the role of ships in underwater reef building- do these things really belong?- we just keep adding more. I think one of the largest questions is, why would we be making artificial reefs? The answer is varied. One major reason seems to be that we know that creating a reef will bring divers to that area- you are basically creating a space where you know that people are guaranteed to see the types of organisms that they imagine are in the ocean. In many ways, this is the impact of TV and public aquariums on our understanding of the ocean: most people think that the ocean resembles a tank of fish- full of beautiful corals, multiple types of fishes, and all of these organisms should be visible immediately. The truth, if you've ever dived is that this is just not so. The ocean is big, dark, cold, and generally pretty empty. Unless you're diving on a reef in relatively shallow water. So governments are trying to draw tourists in and give them what they want and artificial reefs do this. Scuttled ships and decommissioned reefs offer structures on which new ecosystems can grow. In addition, these spaces are being built in places where humans have injured the existing reef structure. In places where reefs have been destroyed or are in decline, humans are using these reefs as band aids for the injuries they've caused. Finally, there is some evidence that these artificial reefs increase fish stocks. Especially in areas with little diversity or decreasing fish stocks, the rigs seem to offer spaces for fishes to feed and hide. Slate just reported this week that a large amount of BP money from the oil spill is being used to create artificial reefs to increase fish stocks. There are ongoing debates about these artificial reefs and the possible positive and negative impacts on ecosystems. Studies show that rigs and ships (along with concrete pyramids) are successful in facilitating reef growth. However, the question is, at what cost? Some suggest that, while these spaces increase fish stocks, they also allow poachers and illegal anglers to hone in on fish attracted to these areas easily; instead of large fish being spread around a large area, the reefs concentrate these fishes and make poaching easy. Basically, it gives new meaning to "shooting fish in a barrel". In addition, questions have recently been raised about the impact of these spaces on the spread of invasive species. Some researchers suggest that these wrecks amount to a disturbed ecosystem and allow invasive species to build strong communities that will then increase their numbers and allow them to spread more rapidly though the ocean. Most reports are relatively early on the colonization of these spaces by corals, but most suggest that these spaces grow more slowly than natural reefs and support smaller coral (although some researchers believe this could change over time). Most of these studies are from the last 15 years and many in the last 10, with researchers calling for more expansive research on the impact of disintegrating ships on the health of these ecosystems long term. What is interesting to me is the way that we take for granted (politicians and the public) that we already know the answers to the questions. Most people don't bat an eye at the idea that there is a ship being sunk to create a reef. It is this type of naturalization that I fear where rigs and small level pollution are concerned. It is true that we currently recognize sunken cars, rusted cans and broken bottles, and floating plastic, as not belonging in the marine environment. But Finding Dory did something concerning- it normalized that trash by having characters co exist without struggle. So the question is, would it have been better for conservation goals to draw the ocean without pollution in the hopes that children would imagine it as such (and be startled when it is trashed) or is it better to show it as a site of trash in the hopes that children will want to clean it up. I'm of the thought that the former is more useful than the latter. I'm open to conversation. I haven't seen any of the films, so I'm surprised that the issue has controversial features. Well, Disney sells tons of plastic everything. I'm afraid that children will have to learn about these issues from informed parents. Apathy is a problem, so those that care will have to visit schools, set up booths at fairs, protest, boycott and raise Cain, while doing our utmost to avoid plastics, setting an example for those who might learn from us. I don't know how commonplace they are, but at least one is available at www.5gyres.org. You can hold your breath and die waiting for legislation or you can develop a multi-prong approach: change your lifestyle, educate and work on legislation. I'm planning to prepare a PowerPoint presentation for my towns City Hall to encourage action. We'll see if they drag their feet. That's a''. Relaxing Humidifier avails the humidifier collection with huge variety such as fish tank humidifier, aromatherapy humidifier, wood grain humidifier and much more at pocket-friendly rates in USA.